Testing out my MSR Pocket Rocket for food prep. 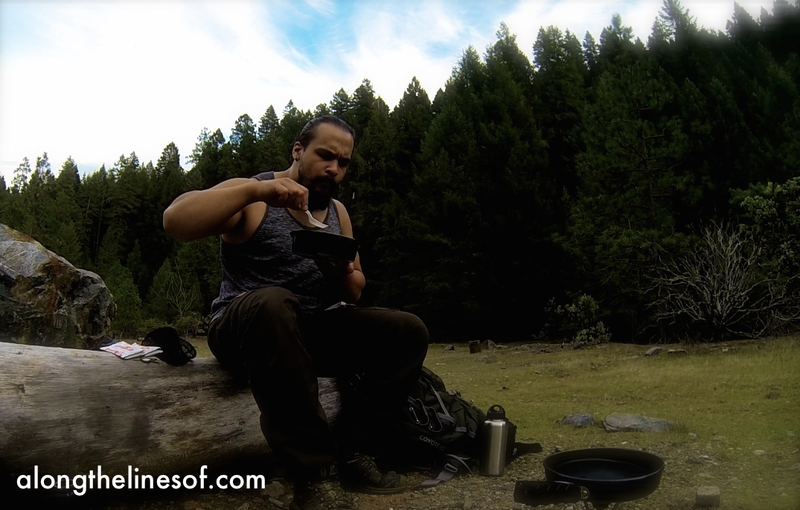 This post is a response to a reader comment asking me any advices I had on getting started with hiking, backpacking and outdoors stuff in general. I’d like to preface this response/post by saying that I consider myself to be just a step above an absolute beginner as far as outdoor stuff is concerned. I’d love to say that I’m “outdoors guy” but in reality, I can’t because I’m “always stuck at the gym guy.” There are a handful of people I’ve met that are both, but as far as I’m concerned, I’m an “appreciator” and a learner until I can devote more time to getting out and enjoying the outdoors along with all the various activities that being outside has to offer. Like you, my family didn’t really have an interest outside of car camping at campsites. It wasn’t until I was in college that I needed an extra 3 units to burn so my best friend and I took a class called “the outdoor experience.” In it, we did a variety of outdoorsy activities with actual formal instruction culminating in a 2 day backpacking trip with the entire class. This trip in particular sparked my interest in backpacking as an activity. It was a surreal experience to see how the simple act of being 10 miles from where we parked our car affected everyone’s personality and general feeling of preparedness and comfort. After this, I started hiking on my own and joined a rock climbing gym where I took particular interest in bouldering and slacklining. I also had to take a few classes on the care of athletic injuries which increased my general knowledge base and overall comfort level in the outdoors by myself. That being said, my advice to you is similar to my advice if you had wanted to start playing guitar, lifting weights, drawing or most other skill sets. 1) Find people with similar interests. Here is a short anecdote for you. When I was in high school, I taught myself how to play guitar. It was relatively easy. How? Well, all of my friends were learning how to play instruments as well, so I picked up all the basics well enough to where I could teach myself. The same goes for lifting weights. Want to get really good? Find a team; preferably one with a good mix of beginners and people better than you. For your purposes, going online will always be a good resource (as long as you keep in mind that people online, in forums, etc are usually never the people they portray themselves to be). Rock climbing gyms are also another great spot to meet ACTUAL people. These types of gyms are the most social, second only to (you guessed it) Crossfit gyms. The main difference between the two is instead of fitness nuts, you will be making friends with outdoor nuts and granola types. Some of the better gyms will also have organized functions outside of rock climbing. 2) Start small. I will write more about this after my third point but in my opinion, day hikes are the best place to start. 3) Treat every outdoor experience as a learning experience. Even if you go to the local park or next to the river or a simple hike around a high traffic lake, treat every experience as a learning one. Test out your knowledge and equipment on the small scale before you make the jump to buying expensive outdoor equipment. Coming back to my second point, the day hike is where I would recommend starting your experience outdoors. You can make these as easy or as difficult as you’d like. You can stay close to where you live or you can venture out 1-5 hours and be back before the day is over. This way you can learn where you’d like to spend your time outdoors. For me personally, I found that I like visiting small lakes high up in the Sierras. They provide scenic viewpoints and a set “destination” before you turn back and go home. They can also serve as “scouting trips” where if you like the location, you can bring a pack up next time and stay the night. 1) Hiking boots/shoes: Realistically speaking, some simple running shoes with suffice for most low impact hikes. For me, I use Solomon’s line of trail running gor-tex shoes for some of my more simple hikes. Generally speaking, your footwear is less important for day hikes when your loads will be between 0-40lbs. As a personal preference, I will always default towards a tall boot (around 8 inches). Even while doing general fitness stuff in the gym, I will gravitate towards the hi-top or wrestling shoe. In my younger years, I had the propensity to roll my ankles (mostly due to my fat thighs and poor walking mechanics). You should be able to find a pair of boots for around 100 bucks (sometimes less). The midsole of your boot is less important than on long ventures with a heavy pack. Your main concern should be comfort and water tightness. Keep in mind, your backpacking boots will be different than these ones, so if your funds are tight, use running shoes you already have for your day hikes and throw down some more skrilla on your backpacking boots. 2) Long (hiking) pants: this is a personal preference but also a recommendation. I used to cruise round in cut-off jorts all day, bro. But after reading a bunch of horror stories about ticks and not having an extra pocket or two when I need it, I’ve switched to the tactical or outdoor pant. Yes, I know. It’s 100% not cool to try and look like MR. TactiCOOL. But trust me, having more capabilities on your clothing plus an added barrier between you and the potential for Lyme Disease is well worth looking like an arm chair commando. I’ve had good experience’s with the Taclite Pro from 5.11. This company also released a new line with more stretchy material for added mobility. These are reasonably priced but like I said earlier, you’ll look kind of like a nutnfancy wannabe (which I’m OK with). Another brand I’d recommend is Fjallraven. My main critique of these pants is that they are EXPENSIVE and they lack back pockets and a knife pocket. They are however, durable, waterproof (if you buy the greenland wax to go with them), mobile, and you don’t look like a mall cop while wearing them. That’s it for attire. I’ll let you figure out the upper body stuff for yourself. Now onto your day pack. I have a specific one that I’d recommend but I’m planning on doing a stand-alone review later on. For now, assess what you want to take with you and find a pack that will hold everything. 3) Bottle of water. You’re not going to need a purification system unless you want to bring it for testing purposes. I use the Katadyn Hiker model and it has served me pretty well thus far. If you’re concerned with viruses or don’t trust your water source, you can also bring iodine tabs and/or boil your water (this would necessitate investing in a camping stove). 4) First aid kit with the addition of pre-tape, athletic tape and hand disinfectant. Buy yourself a simple first aid kit, but more importantly, get familiar with what’s inside and how to use the materials. Formal training is preferred but not necessary. Realistically, what you could be dealing with will (hopefully) be no worse than bumps, scrapes and possibly a rolled ankle. That’s what the athletic tape is all about. I received formal training on how to properly tape an ankle. It couldn’t hurt to look up a few videos on the subject. The hand disinfectant is obviously to clean your filthy meathooks. I’m assuming you’d plan ahead and drop a douce before you go out, but cleanliness before you eat is always preferred, even out in the woods. 5) Flashlight. I actually carry two. One full-size and one pocket pen light. I prefer lights from Fenix or Streamlight. 6) Small EDC folding knife and/or multitool. No need to go overboard here unless you like collecting this stuff. Realistically your folder will be used to do things like spread peanut butter and open stuff up. The most used function on your multitool will be scissors (not all have this) and bottle opener (because beers). Spyderco and Kershaw have the most variety of high quality folders from 20-40 bucks. Leatherman is still the leading name in multitools. Look into the Juice model. If you’re not into this stuff, just go with the multitool. If you ARE into this stuff, keep in mind that full tang fixed blades will always be mechanically stronger than a folder, so you won’t be doing any of the cool outdoorsy stuff that you see on youtube. But hey, I’m no bushcrafter and I’m assuming you aren’t either. 7) Bug spray. In my experience, bugs don’t give a DAMN about your spray. But it couldn’t hurt to bring along anyways. Oh and I’ve found I’m not as dependent on sunscreen as my fair skinned friends but you might need it. 8) Snacks. Because snacks. Keep it simple in the beginning. And remember if you pack it in, pack it out. 9) Really loud goddamn whistle. Or a signaling mirror. Or some other back up plan way of communication just in case you’ve had a “I’ve fallen and can’t get up moment.” This is actually something I keep in my EDC pack all the time. It sounds funny, but your puny human voice only carries so far. Get a really loud goddamn whistle for just in case. If anything, use it to wake up your bro or your significant other if they piss you off while they’re drunk and pass out on your couch. 10 (optional) Whiskey or beer. I’d recommend not bringing this stuff if you don’t normally drink. However whiskey is part of my regular diet so I like to bring a small amount for when I reach my destination and want to relax. Keep in mind 1) dehydration, 2) alcohol actually lowers your body temperature. On top of this, bring anything else you want to pass the time, like a book or some sort of activity. A spare shirt or henley might be nice too depending on the time of year. If you like this post, I’ll do a backpacking one in the future, though I have less experience in what systems actually work and what doesn’t. I can’t thank you enough for your thorough response to my noob query. Tons of useful information, pasting this to a word doc now. I think the best tip you gave was to start small and work into the whole outdoors/ camping thing. As much as I want to just get out there and do some Dave Canterbury- type bushcrafty business, modest, deliberate progression is as usual the boring and correct course of action. Thanks again for all the right advices. No problem! I actually enjoy writing about this stuff nowadays more than weightlifting stuff. Also, one more thing I forgot to mention is that if you wear a cotton shirt or hoodie or whatever, and it gets wet, you will STAY wet. Wear clothes that are a blend or have wicking properties.